You get ALL OF THIS!! Check your inbox for an email from me, girl, because I need your mailing address! And thanks to everyone who entered! Hopefully we'll be seeing you around the nail files! The linkup opens every Friday! WAHHHH! The comment I just left got eaten by blogger!! But OH EM GEEEEEE YAYYYY! Thank you SO SO SO MUCH!!! I can't even believe it! You rock! I love the drum roll par of the movie lol! Congrats Joey! Is that our fellow Nail Files sis Joey?? That is so fab!! Thanks Jennie for having an awesome giveaway! YAY!! Whoohooo! Haha my first thought was, "OUR HODGES PODGES JOEY?!" So happy for her!! 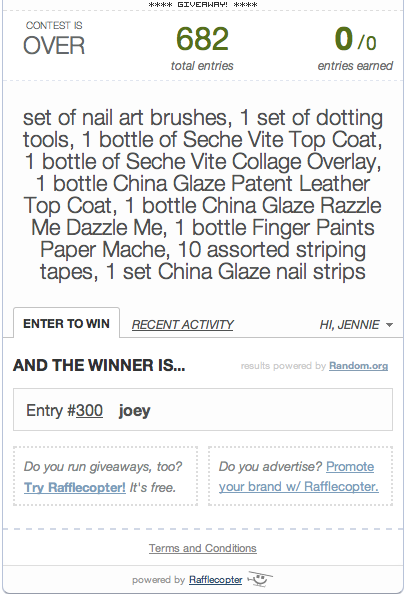 Thanks for the giveaway Jennie, you da bestttt! ps. am i going crazy...where can I follow you on your page?